When I first started this blog a couple of months ago, I wasn’t sure how things would go. Two months on, I’ve discovered some fantastic blogs and added so many books to ‘The List’, I’ve lost count! One of the things I’ve enjoyed most is exchanging thoughts on books (and the occasional conversation about wine, too) through your blogs and twitter. I’m still thrilled and amazed that anyone is interested in reading my views on books – thank you so much to everyone who has taken the time to read, comment on or share any of my posts. It’s great to hear your thoughts and to chat with you about books. 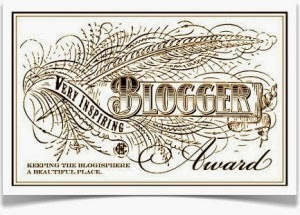 Earlier this week, I was delighted to be nominated for the ‘Very Inspiring Blogger Award’ by two bloggers whose blogs I hold in very high regard. So, thank you Cathy at 746 Books and Marina Sofia at findingtimetowrite for nominating me – if you don’t already follow these two blogs, please do take a few minutes to check them out as they’re both excellent (and I’m not just saying that, they truly are). I’m a doctor, but not a medical one – I have a Ph.D. in chemistry. Sadly, my attempts to synthesize a breakthrough in antibiotic therapy ended in disappointment, and I moved on to other things. Ten years ago, I abandoned the corporate world for life as a freelancer in customer research and analysis. Despite the uncertainty, it’s the best decision I ever made. In my spare time (typically Fridays) I volunteer at our local community library. In my other life, I would be Vivian Sternwood from The Big Sleep…dream on Jacqui, dream on. My favourite colour is blue; any shade of blue will do except navy. I’m allergic to saffron and shellfish – the two together would probably tip me over the edge. No paella for me, unfortunately. It’s probably no surprise to you that I like wine, but people often ask me to name my favourite wine. I find it impossible to single out just one wine as my preferences vary depending on my mood, the occasion, the season…so many things. But if I could only drink wine from one country, it would be Italy. No contest. 1streading’s Blog – Grant’s very professional reviews cover a wide range literary fiction – translations and books written in the English language. An excellent blog. Babbling Books – Brian’s blog is a fairly recent discovery for me. Brian loves to discuss books, and his reviews are very informative and enlightening. Bookemstevo – Another fairly recent discovery for me – very eloquent and insightful reviews here, mostly literary fiction. Dolce Bellezza – I’m so glad to have met Bellezza through the IFFP shadow group. Bellezza reviews a wide range of literary fiction (both new and old), and she has a wonderful way with words. Follow the Thread – David is interested in literary fiction (both novels and short fiction), especially narratives with a speculative flavour in terms of prose, form or structure. Just William’s Luck – Alongside Max’s blog (Pechorin’s Journal), Will’s blog was one of the first I followed. Will has been blogging for several years and now vlogs (video blogs) at Just William’s Luck on YouTube. A Life in Books – Susan’s blog covers book reviews, recommendations and news, and her background in the book world shines through. The Little Reader Library – Lindsay loves how words and language can be used to create stories, and she reviews a very diverse range of books, many of which are new. I find Lindsay’s reviews especially useful for my work with the local library. MadabouttheBooks – Helen is a bibliophile by nature and enjoys sharingher thoughts on recent reads, mostly literary fiction. She loves chatting about books! Messenger’s Booker (and more) – Tony follows lots of book awards, and he reviews longlisted titles – an interesting blog for fiction in translation. Pechorin’s Journal – Max’s blog was the first literary blog I followed, and it remains a firm favourite of mine. Max writes about every book he reads – literary fiction (often in translation), crime (mostly noir and hardboiled) and science fiction. Tony’s Reading List – Another advocate of literature in translation. Tony’s reviews are a pleasure to read, and they often introduce me to new authors. WinstonsDad’s – World-lit supremo, Stu, is my first port-of-call for literature in translation. Stu champions translations, and he instigated the legendary #TranslationThurs hashtag. Word by Word – I love reading Claire’s insightful reviews and her words seem to flow with ease. Claire’s love of language is very evident from her writing. The Writes of Women – Naomi is a passionate champion of books by women writers. Her perceptive reviews cover fiction and non-fiction, literary and commercial, new and old – all books written by women. I would have listed Cathy at 746 Books and Marina Sofia at findingtimetowrite, but they’ve already nominated me, and I think the idea is for me to highlight other blogs! I haven’t included any wine blogs as my two favourite wine bloggers have stopped blogging for a while (and most of my wine conversations take place on twitter anyway). If I’ve nominated your blog, there’s no obligation for you to participate; I don’t want anyone to feel any pressure to nominate others – it’s entirely up to you. I just wanted to take the time to highlight some of my favourite blogs and to say ‘thank you’ for your support. This entry was posted in Book Reviews and tagged Bloggers, books, Very Inspiring Blogger Award on July 6, 2014 by JacquiWine. How interesting, Jacqui – I’m also allergic to shellfish, my favourite colour is also blue, and I’m also a doctor (in social anthropology though, but chemistry was my first love)… Sometimes I think that when you have a similar taste in books, other similarities emerge too (OK you, me and a million other people, but still…) Thank you for the kind mention and for taking part in this! And keep up the good work! That is interesting – what a coincidence! You’re very welcome, and thank you again for nominating me, very kind of you. I’ve loved watching this award fly through the interwebs, I’ve found loads of great blogs. I think it is awesome that you volunteer at your local library! It makes me sad you can’t have Paella, but considering it could kill you, it’s clearly for the best. I agree, Alice. These awards are a great way to get to know other bloggers and find new blogs of interest. I’ve already added quite a few to my blog reader. Thank you! I very much enjoy volunteering at library although it’s a shame our county council has taken a scalpel to library funding. We’re now very heavily reliant on a network of local volunteers. Yes, I’d like to be able to eat paella, especially as I love Spanish white wines – there’s a match made in heaven there, but sadly not for me! Thanks so much for your recognition Jacqui (Blushing). I am so honored. I am familier with some of the above blogs but not all. Thus I will be checking them out. I too hate “What is your favorite….” questions in general. You’re very welcome, Brian – I’m delighted to include you and your blog in my list! I hope you find a few other blogs of interest to you – it’s a great way to discover new voices. Yes, I wasn’t sure what to say with the seven-facts-about-yourself thing, but I guess it’s about sharing something personal. I’ve just realised that I slightly missed the point of your final comment, Brian – sorry! Yes, it’s a bit like being asked to name your favourite book, isn’t it? How to choose just one? Well congratulations for your nomination and Bravo for getting on the blogging bandwagon. Totally deserved recognition for an excellent blog and choice of books! Its been a while since I saw an awards round and its a wonderful way to promote books and those that love reading them, love the twitter interactions and community that develops around them, I don’t read nearly as much as I’d like to, but can’t help being a book fashion victim, forever perusing what others are reading, clocking the titles up there for later retrieval. Reading blogs is kind of like window shopping! Thank you too for the nomination, and for being such a great blogger and supportive community member! Thank you, Claire – that’s very kind of you to say! I’m enjoying blogging. I have to admit. I completely agree. These awards are a great way for readers and bloggers to make new connections and find new blogs of interest. Great analogy about window shopping. I’m also rather prone to getting swayed by what others are reading, and I’ve lost count of the number of new books acquired recently. You’re very welcome – I’m delighted to list you and your blog in my nominations! Congratulations for your nomination…I am first time visitor to your blog and see lots of great books to read about! Always wonderful to see a list of blogs I can investigate. I don’t do that as often as I should! Thank you, Nancy – that’s great to hear! And thanks for taking the time to visit here and comment. If nothing else, these awards are a great way to find other blogs of potential interest. I’m off to check out your blog now! Thanks you so much Jacqui it is nice to be acknowledged for something I enjoy doing. I’m going to join Bellezza though and not continue the thread as your list of fifteen includes a large number of the blogs I follow too. Taking those away I would honestly struggle to come up with fifteen inspirational ones (maybe ten). Like Bellezza and yourself, being part of the Independent Foreign Fiction Prize shadow Jury was a highlight for sure and I am already looking forward to 2015. Keep up the great blog, your work too is inspiring. You’re very welcome, Tony, and thank you for your kind words. I quite understand your thinking on this, especially as you already follow many of the blogs I’ve listed here! Yes, participating in the IFFP shadow group was enlightening and great fun, too. I hope to participate again next year. All great bloggers listed there. Also, your life is super interesting! Sometimes it is difficult to imagine someone whose profession is not related to books devoting so much time to books and a blog, but there are amazing exceptions like you :) I will be a doctor as well, but a doctor in books which is even better – and far more creative – than a medical doctor… right? Thank you for your kind words, Elena. I love reading, and I’m very much enjoying blogging as a bit of a respite from work. Congratulations on your nomination, too, as I’ve noticed your name on Claire, Cathy and Marina’s lists of nominees! All the very best of luck with your doctorate; how fascinating to focus on books for your studies, and it’s certainly an opportunity for you to flex your creative skills. If I had my time again, I think I’d go down the literature route. Thank you so, so much for nominating me for this, Jacqui, and apologies for being so slow to realise that you had, I’ve had a strange few days, so it was wonderful when I read my emails properly and saw your comment on my blog about this. You’re very welcome, Lindsay – I’m so glad you’re thrilled! No need to apologise at all. Yes, I very much enjoy volunteering at the library. Two or three years ago, ours was threatened with closure, and the locals campaigned for it to remain open. To cut a long story short, we’ve managed to keep it open as Community Library staffed by volunteers, and it seems to be going well so far. I’m glad to hear that yours is doing well, too – they’re so important for the local community, aren’t they?